Do you have hair that you would like to remove? Are you sick of shaving or waxing only to have to do it again when the hair regrows? You are in luck, there are now options to totally remove the offending hair. The two options to remove hair permanently are laser hair removal and electrolysis. These two methods are permanent but take several follow up visits in order to reach the wanted clearance of hair. These follow up visits need to be spaced apart because the hair has to be treated during a particular stage in its life cycle. Treatments prices can vary, both from salon to salon and from person to person. Depending on the person and the amount of hair that must be treated, what may cost one person fifty dollars a session may cost another around two hundred fifty dollars. It is a good idea to look around and get prices from different spas and salons in order to find the best prices. 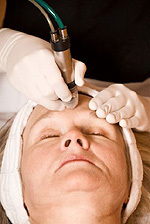 The first method of permanently removing hair is Electrolysis. Electrolysis uses an electrical signal to kill the hair follicle. Using a small sterile metal rod inserted into each hair shaft, an electric signal is sent all the way down into the root of the hair, thus killing it. Permanently destroying the hair. Electrolysis has been used for over one hundred years so it is one of the most used and relied upon methods. This method can cause some slight discomfort - a slight stinging sensation is usually the result. This treatment is regulated in some states, so if it is regulated in the state you live in be sure your electrologist is properly certified. The next method for permanently removing hair is Laser Hair removal. This method is relatively new compared to electrolysis. This technique uses light at a certain wavelength to damage the hair follicle. Most people who use this method find it very effective. This option costs around one hundred to two hundred dollars a session so it is a bit more expensive than electrolysis per treatment. However, less treatments are needed in total so the price difference between this and electrolysis may even out after a few treatments. The laser option is a great option for women who have unwanted hair on their face that they want to get rid of permanently. Some people want to try to remove hair permanently at home, you may purchase an electrolysis machine for at home use. There is also a new cream that has been developed to slow the growth of hair, this may be an easier option for people who want to do this from home.